Linda Gask has an essay in The Lancet Psychiatry entitled 'In defence of the biopsychosocial model'. Progress does need to be made on clarifying George Engel's biopsychosocial model (see previous post). Engel’s model promotes a holistic psychiatry in the same way as critical psychiatry and is a challenge to biomedical dogmatism. His original Science paper was written in response to a paper published in JAMA by Arnold Ludwig (1975) called ‘The psychiatrist as physician’. Ludwig was concerned about the state of psychiatry, which he saw as under attack from what we now identify as 'anti-psychiatry'. His response was to accept that modern-day psychiatry is vulnerable to such charges. His solution was to retreat to the medical model. As far as Ludwig was concerned, psychiatry should deal with medical illness, including neuropsychiatric and medicopsychiatric disorders, rather than nonpsychiatric problems, which are more appropriately handled by nonmedical professionals. This position is what has more recently been called a 'remedicalised psychiatry' (see previous post). Ludwig was clear that psychiatry's viability was dependent on an understanding of mental illness as due to known, suggestive or presumed brain dysfunction. Interestingly, he predicted, “I am not optimistic that there will be any sudden and dramatic resolution of these issues” (p. 604). Subsequent history could be said to have proved him wrong in the sense that psychiatry has become more biomedical since the publication of DSM-III in 1980 and the development of brain imaging. Modern psychiatry has become more biomedical than even Ludwig anticipated. Engel, by contrast, was not happy with Ludwig's proposal for change. As far as he was concerned, all medicine, not just psychiatry, was in crisis. He believed doctors had become insensitive to the personal problems of patients and preoccupied with procedures. In short, medicine is too disease-oriented rather than patient-orientated. 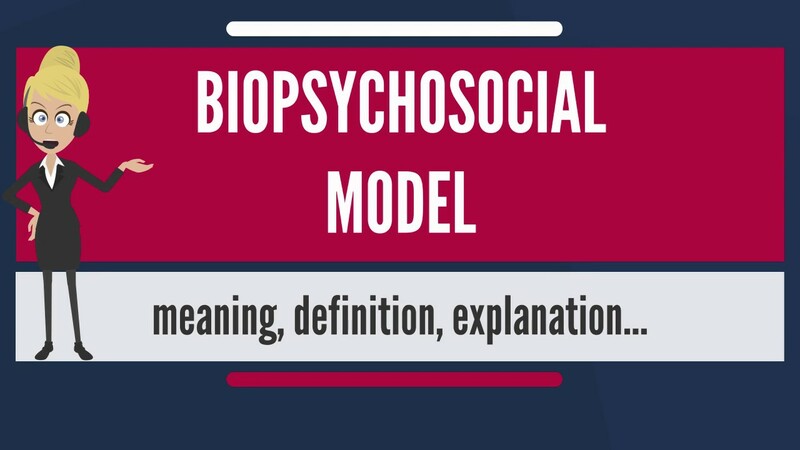 For Engel, the biopsychosocial model has real advantages, by taking account of cultural, social and psychological considerations as well as biological. Furthermore, it avoids the polarisation between biomedical reductionists, amongst which Engel would have included Ludwig, and exclusionists, like Thomas Szasz, who deny mental illness. Szasz, in fact, had the same biomedical understanding as reductionists of the nature of illness as physical lesion, but did not believe in mental illness because a biological basis has not been established. I have always tried to be clear that there are aspects of Szasz's views which do not coincide with my views about critical psychiatry (eg. see previous post). My views are more identified with Engel's. What is of interest is that both Ludwig and Engel were trying to salvage psychiatry in the context of ‘anti-psychiatry’. This is why this situation is relevant to critical psychiatry, which has its origins in anti-psychiatry (see my book chapter). I am suggesting that Engel’s biopsychosocial model is a viable form of critical psychiatry. Many psychiatrists, like Linda in her essay, would say that their approach to psychiatry is biopsychosocial, taking into account psychosocial factors as well as biological. I agree that most psychiatrists are pragmatic in their approach. However, even though most psychiatrists are not narrowly biomedical, they are still biomedical (see previous post), in the sense that they generally believe that mental illness, or at least major mental illness, such as schizophrenia and bipolar I disorder, is due to brain abnormalities, even though the evidence is against this conjecture. More than the empirical evidence, the philosophical argument about the relationship between mind and body is against such speculation. Psychiatrists now rarely become involved in this conceptual debate because they expect that brain research will find the solution to mental illness. As pointed out by Linda, the biopsychosocial model has been critiqued as being too eclectic by Nassir Ghaemi, leaving psychiatry with no overall theoretical structure as "all theories are possible and all perspectives are valued" (p.1) (see my book review). I agree that psychiatry can be eclectic with, for example, biological and psychotherapeutic treatments being combined without any systematic theory to support such a therapeutic strategy. There is also commonly a split in the aetiological understanding of mental illness, with major psychotic illness being seen as biological in origin, and more minor, neurotic illness seen as having psychosocial causes. The real origin of eclecticism in modern psychiatry, though, is not in the biopsychosocial model but in the mainstream response to ‘anti-psychiatry’. Anthony Clare’s Psychiatry in dissent, mentioned by Linda, was a response to anti-psychiatry (see previous post). It eschewed a well-defined theoretical basis for practice. In this way, Clare avoided the worst excesses of reductionism and the objectification of patients that caused particular concern to anti-psychiatry. This approach is what is now often labelled as ‘biopsychosocial’ and I worry that Linda is using the term in this way. Most psychiatry is only semi-critical in this sense (see previous post). The true meaning and implications of Engel’s biopsychosocial model have been diluted. Interesting blog Duncan...but what do you think is the true meaning and implications of Engel’s biopsychosocial model? Thanks for your comment, Helen. Sorry if my post may seem to have been cut off short. Perhaps I need to do another post to clarify what I mean about the ideological implications of critical psychiatry. Don't most ordinary UK psychiatrists acknowledge that psychosocial stressors (including trauma and abuse) may be more important causal factors in many/most individual patients but they can only address those stressors with the limited human resources they (or their CMHT team manager) have at their disposal? Why those human resources are 'limited' would seem to be a more pressing issue for someone who foregrounds the 'Politics of Mental Health' on their Twitter profile (@HSpandler) rather than the academic and abstruse 'true meaning and implications of Engel’s biopsychosocial model'.